Columbia, SC is a place I never wanted to live long-term, then I didn’t want to leave (but had to), and whenever I go back it is refreshing to my soul to visit friends and remember aspects of myself I’ve forgotten. I left before 7AM Sunday morning to drive down to arrive in time for church (where I attended in college). It’s the most special church I’ve ever encountered, with people who are loving, caring, intellectual, fun, deep, and from many walks of life. The children have all grown up and my college acquaintances have children—life moves forward. I got to see two of my best friends from college…and we laughed so much. Those friends are the best kind. And we drank margaritas and had the best homemade, personal pizzas EVER. At the last minute, I learned a sweet friend was also in town with her roommate…and hedgehog. Awesome conversations about feminism, social justice, racism, belief systems, and interacting with people you love but who just aren’t on the same page. And, I got to hold her hedgehog! Tuesday morning, I had breakfast with my brother at my alma mater. The caf is still the same—even down to my half a grapefruit (yum!). But, they’ve added a great little coffee shop downstairs (why couldn’t that have been there when I was a student?). Till the next solar eclipse! 2024! To celebrate the launch of The Teapot Journalist, I am hosting an awesome and ethical giveaway to ONE winner! One of my goals through this blog is to explore what options are provided to us, as consumers, to purchase items that are made by people who are paid a fair and living wage for their work. What I love about Ten Thousand Villages is the beautiful, quality craft work of their products AND that they strive to educate others about the need to be ethically made and paid. You can read more here. Prize: As seen above, a beautiful, fair trade mug made in Vietnam. 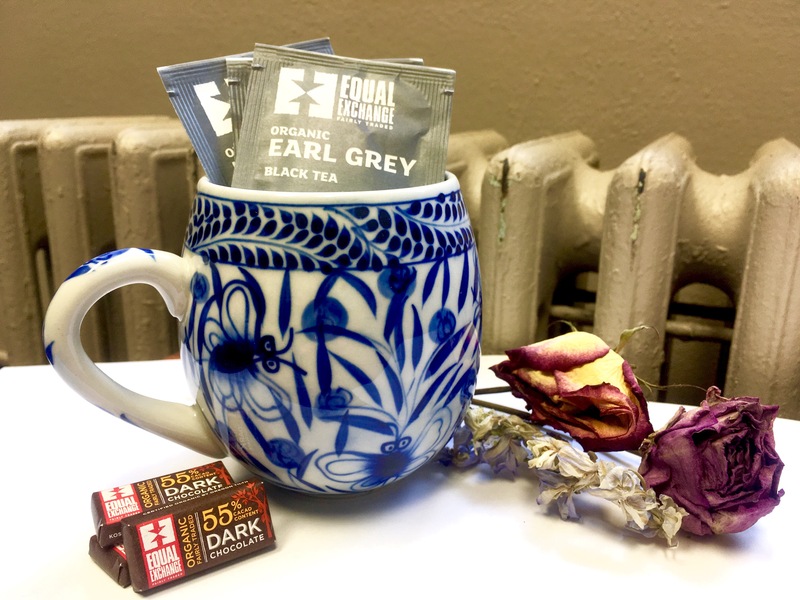 Plus, fair trade Earl Grey tea (my personal favorite) and fair trade chocolates (all purchased from Ten Thousand Villages) ! Basically, a perfect recipe for a rainy Saturday—you just pick the movie or book. *Note: If you don’t tag, it doesn’t count*. Thank you for your support in this exciting and new endeavor. Also, tomorrow’s post is an opportunity that fell into my lap—and I can’t wait for you to read all about it! Have a great day, and enjoy a cup of tea!